Bible Cartoons: Daniel 06 - The lions’ den - Scene 11 - Were you rescued? 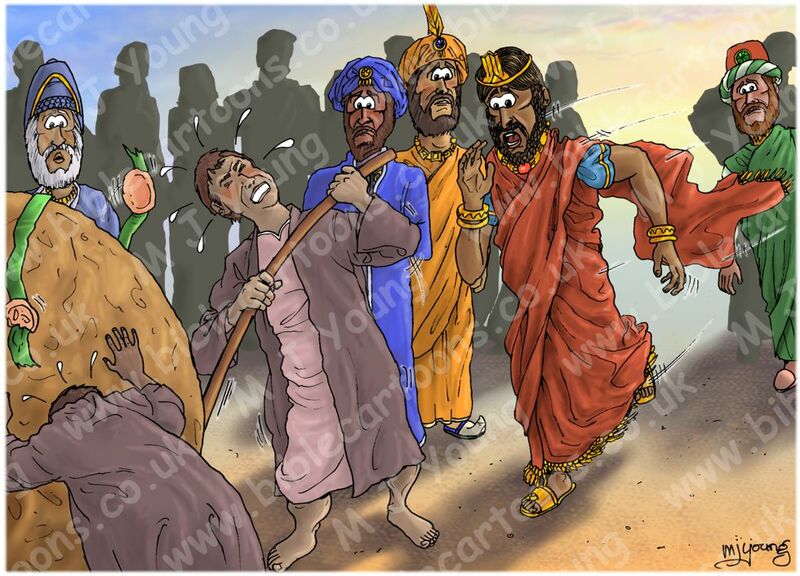 Bible Cartoon: Daniel 06 - The lions’ den - Scene 11 - Were you rescued? The Bible text above tells us it is “Very early morning”, so I have drawn the scene just after sunrise. This scene comes the day after scenes 01-10. Pale early morning sunshine (seen in the background) illuminates this scene from the right, casting shadows to the left. From left to right: one of the noblemen (in blue robes) can be seen behind the large stone over the lions’ den. Two servants (wearing dusty violet robes) are staining to move the stone. The three wicked administrators (in Blue, Gold and Green robes) can be seen, looking worried! King Darius (in red and gold robes) is running towards the stone on top of the lions’ den. As in Scene 09 – Sealed stone, I have drawn a line of simple outline figures behind the main characters, representing a crowd of onlookers, nobles, the king’s courtiers, etc, in the background. I have drawn the three wicked, scheming administrators in this scene, watching the events unfolding before their eyes. I have drawn them with worried expressions on their faces, since they probably realise that their own fate hangs in the balance by now! I enjoyed drawing the servant straining with a bronze bar, trying to move the stone off the entrance to the lions’ den. His screwed, straining expression and the sweat lines coming off him were fun to draw!